DETROIT — If the future is female, as the slogan says, then the future has arrived at General Motors. 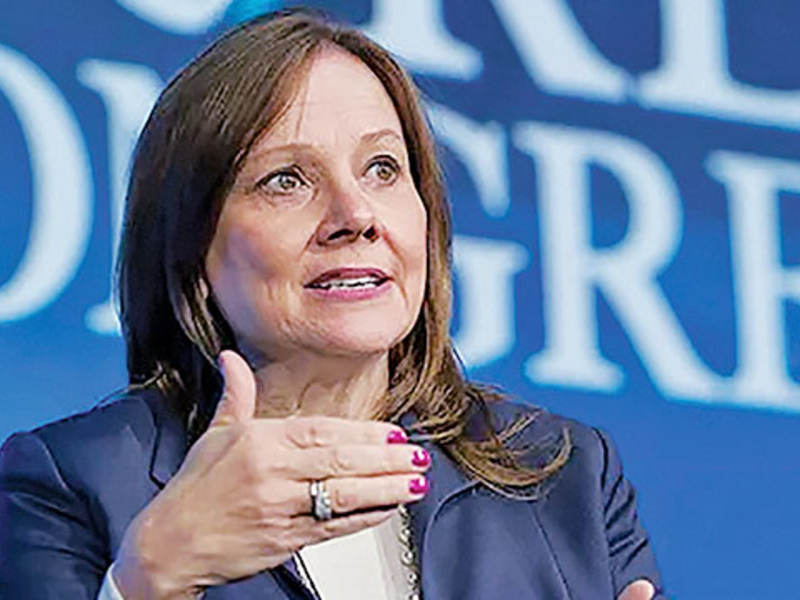 In the five years since Mary Barra, 57, was appointed the first female chief executive of a major automaker, she has added the role of chairman. Among her possible successors, at least one is also a woman. And depending on decisions to be made later this month, GM’s board of directors could become only the third in the entire S&P 500 to have a female majority. Advocates of gender balance and corporate diversity are watching Barra’s tenure with cautious optimism. She’s the highest profile in a small but growing class of female CEOs, joined April 15 by Best Buy’s Corie Barry. The glass ceiling is still a realit — women run only about 5 percent of large companies. So is the glass cliff, the phenomenon wherein women only get tapped to lead companies that are already teetering. Even in a stable environment, mostly male boards are often quicker to remove a female leader at the first sign of turbulence. Perhaps that could be called the glass rug. Nevertheless, Barra — along with Barry, Lynn Good at Duke Energy, Gail Boudreaux at Anthem Inc. and the women running defense contractors Lockheed Martin, Northrup Gruman, and General Dynamics — could create the critical mass needed to pull other women to the top of the corporate ladder and support them once they get there. The auto industry is still overwhelmingly male — 14 of the 16 speakers at this week’s New York auto show are men. But Barra’s set herself, and GM, apart for other reasons. She’s been willing to make unpopular choices, idling plants and cutting white-collar jobs to shift focus to future technology, even as the company remains profitable. GM’s acquisition of autonomous driving startup Cruise Automation in 2015 looks better by the day. And while she’s drawn consistent criticism from President Donald Trump, the company’s employees respect her, said Rebecca Lindland, a long-time Detroit auto analyst and founder of Rebeccadrives.com. Wall Street’s been equally sanguine: A majority of the 28 analysts that follow the company rate it a buy and only 1 recommended selling GM shares, according to Bloomberg data. Rod Lache, Institutional Investor’s top-ranked U.S. auto analyst for six years running, signaled his confidence in January. “To the extent that investing in any company is to a large extent investing in the company’s management team, this company clearly stands out,” he said at the Wolfe Research conference in Detroit. Six of GM’s 13 corporate directors are women; among the remaining seven men, three have hit the mandatory retirement age of 72, including lead director Tim Solso. The board could extend their terms or choose to replace them. Depending on what they decide, it could flip to a female majority for the first time. GM declined to comment on the future of any directors ahead of the next proxy, which will disclose the slate. The company typically files its proxy in late April, ahead of a June annual meeting and the formal vote to pick a new group of board members. Women still make up less than 25 percent of directors at larger companies. Michelle Ryan, a professor of social and organizational psychology at the University of Exeter who coined the term “glass cliff,” says boards dominated by men may be more willing to give second chances or the benefit of the doubt to other male executives. Among 64 CEOs of S&P 500 companies who resigned under pressure from 2010 to 2018, 13 percent were women, more than double their share in the broader CEO population, according to data from Spencer Stuart. The power dynamic could shift as more women join corporate leadership, said Axogen Inc. CEO Karen Zaderej. Her otherwise all-male board named Amy McBride-Wendell its lead director last year. Zaderej says having another woman at the table, and in a leadership role, has helped bolster her position on some topics at the company, which focuses on nerve repair and protection. But it’s more than solidarity, Zaderej says. As with autos, more than 80 percent of health care decisions are made by women. When the board was discussing whether Axogen should consider business related to breast-reconstruction after cancer treatment, the duo were able to give a broader picture of women’s views on the topic. Boards are “recognizing that you really need to have that woman’s voice in the board to make sure that you’re thinking about your business from a consumer perspective,” Zaderej said. Only Viacom and CBS have a majority of women directors among the companies in the S&P 500. Best Buy will join that short list when Barry’s appointed in June. But another half dozen are split evenly, while about 25 are one woman shy of parity or even majority. It was Barra’s former boss, Dan Akerson, who presaged the rise of a woman to run a major automaker. “Someday, there will be a Detroit 3 that’s run by a car gal. I actually believe that,” Akerson said in a 2013 speech to members of Inforum, a Michigan non-profit that advocates for the advancement of women in the c-suite. At the time, Barra was GM’s chief product officer.